The year 109 was a big year for the Emperor Trajan. 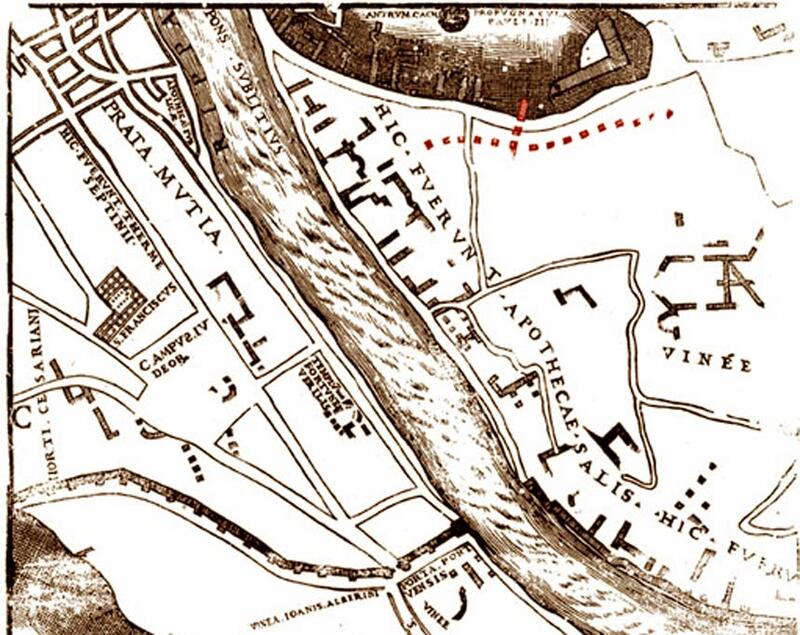 He inaugurated three public works in close succession: His monumental baths complex near the Colosseum, his Naumachia water theatre near the Vatican, and perhaps most significantly for the health of his people, the Aqua Traiana – his great aqueduct which was the first and only supply of clean water from the west of the river Tiber. The baths and the water theatre; on which the Romans liked to re-enact their naval battles for the enjoyment of the local population; would both have required a good supply of water, and between them, perhaps, would have justified the construction of the new aqueduct. 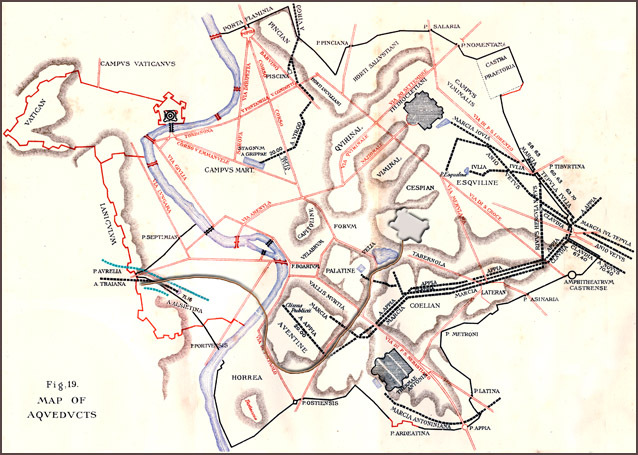 However we have a quotation from the Roman official chronicles, the Fasti Ostienses, which says that the Aqua Traiana was "tota urbe salientem", which indicates that the aqueduct supplied the whole city with a network of pipes and small fountains in every district of Rome. of an aqueduct bridge according to Prof. Rabun Taylor of University of Texas. The Aqueduct arrives in Rome at the top of the Janiculum Hill at a high level above the city. In order to reach Trajan's Baths on the top of the Colle Oppio and the storage cisterns known as the Sette Sale, the aqueduct probably crossed the river Tiber on a large stone bridge or just possibly under the river in a syphon made with lead pipes. The archaeologist Prof. Rabun Taylor from the University of Texas proposes that the aqueduct crossed the tiber on a high stone structure close to the Children's Hospice building at the Porto di Ripa Grande, and curved around the Aventine Hill before turning north towards the Colle Oppio, the hill adjacent to the Colosseum, and the site of Trajan’s baths. 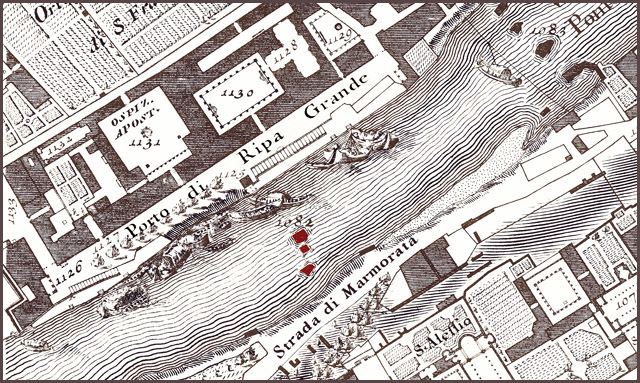 Some evidence of the structural arches can be seen on the 1551 map of Leonardo Buffalini. Little physical evidence of the aqueduct’s path across the river remains, but the inauguration of the baths and the aqueduct within three days of each other in June 109 cannot, surely, be coincidence. Whatever the distribution of the Aqueduct within the city, the Emperor minted coins in 109 and 110 AD which were distributed across the entire empire to celebrate his great achievement. 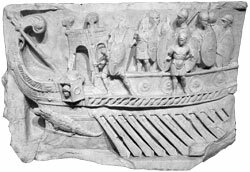 The Roman Water Theatres, also known as Naumachia, were used to re-enact important naval battles. 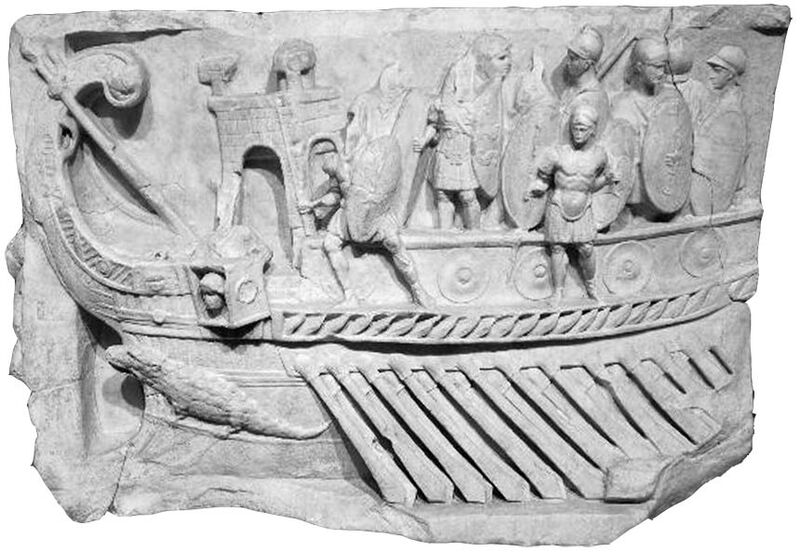 This relief shows the Battle of Actium, when the Emperor Augustus defeated the Ptolomaic Empire of the Egyptians, with a little help from his Admiral Marcus Agrippa. 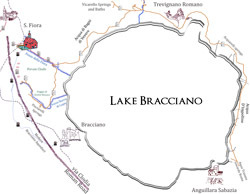 The Traiana across the River? 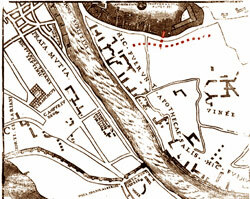 Leonardo Buffalini's map of 1551 shows columns (highlighted in red) emerging from the River Tiber and passing to the south of the Aventino Hill. Did these columns carry the Aqua Traiana to Trajan's Baths? Trajan's baths show similar building techniques. They were inaugurated in the same week as the Aqueduct.